Cocoa and Lavender: Let's Raise a Glass! A couple of weeks ago, friends Susan and Towny posted about verrines (de Noël) on The Modern Trobadors. It was with them that Mark and I had our first official verrines while dining is Provence - both in Roussillon and in Ansuois - for my 50th birthday celebration. I say that these were our first official verrines because I have been serving verrines for years, unaware that they had a name, and were going to be fashionable in France a decade later. Verrines are a wonderful way to serve a small and exquisite opener for your meal - something larger than an amuse-bouche, yet smaller than a first course. Most of all, to me, they are about beauty. ... 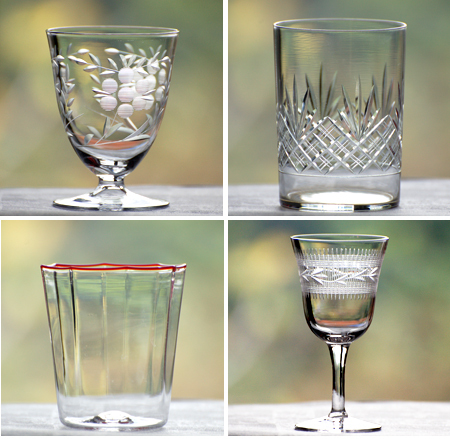 Simply translated from French, verrine means “glass casing.” The glass allows its contents to shine. 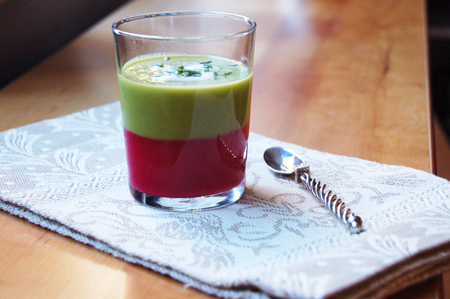 A well crafted verrine is the Fabergé egg of the meal. I served my first verrines sometime around the year 2000. My employer at the time - the director of The Children's Museum of New Hampshire - and her husband asked me if I would create a dinner for them and their important guests from Japan (the Japanese consul to Boston and his wife). I created a meal that was American in its ingredients yet Japanese in its presentation - small portions, delicately prepared and (I hope) beautiful both to their eyes and their palates. The first course at the table was a set of three tiny verrines per person. 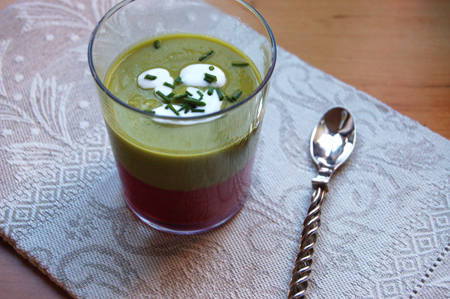 They were tomato-thyme, yellow bell pepper-bay laurel and sweet pea-tarragon soups - red, yellow and green. They were a hit with the Japanese Consul, and it was the Japanese-style serving that made me think, "This is a great way to start a meal!" Since then, I have used verrines for openers, accompaniments, palate cleansers and desserts. As a chef, your only limit is your imagination! One can buy official glassware called verrines, but my guess is that you already have any number of appropriate vessels in your cupboard. I raided our cabinets and found all you see in this post, and I didn't got them all. 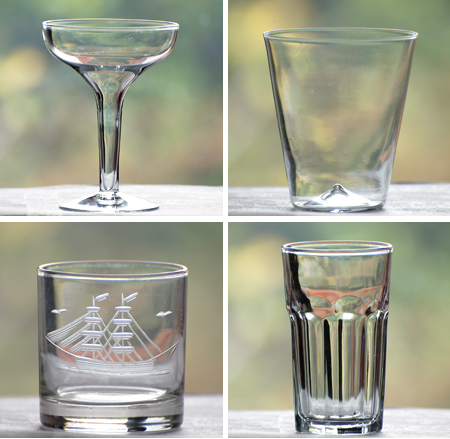 For the most part, a verrine should be clear glass, not etched, but I think that certain recipes might work well with something etched or faceted. Also, they should be small - slightly larger than a shot glass. Susan and Towny gave me a verrines cookbook for my birthday, and it's full of creative ideas for flavor combinations and stunningly beautiful presentations. But, in reading - and observing - it is more than flavors and visual harmony that are combined. Texture plays a leading role, too. From the very simple things such as a deconstructed guacamole or tuna tartare with tomatoes and capers to those requiring a little more preparation such as a bavarois of Roquefort, grapes and walnuts, or a mousse of cèpes (porcini mushrooms) with slices of seared foie gras, one can feel the different components as much as seeing and tasting them. 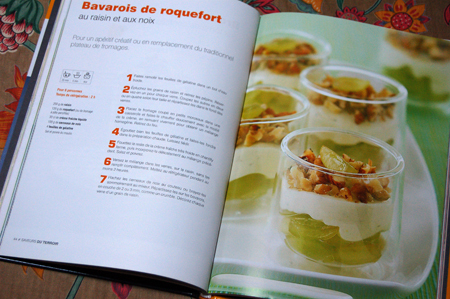 The book also has quite a few nice dessert combinations. Tonight, for our Christmas Eve dinner, we are gathering our good friends for a celebration. Two are bringing hors d'oeuvres, the soup and main course (langoustine tails with fennel, tomato and saffron in puff pastry boxes) are my offering, Another guest is bringing a salad and one is bringing desserts - she has dropped tantalizing hints of mince tartlets or plum pudding! 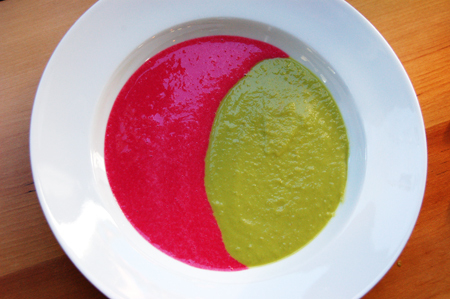 I have made two contrasting soups for for the first course - bright green sweet pea soup and deep red-magenta beet vichyssoise based on recipes from the Silver Palate. I usually serve them in one shallow bowl with both soups meeting in the middle. There are several ways to present them as verrines, though. One way is to serve two shot glasses per person side by side, as I did for my Japanesque meal. Another way is to layer them. First, freeze the bottom layer for 30 minutes then carefully add the second layer; keep them chilled in the refrigerator until ready to serve. 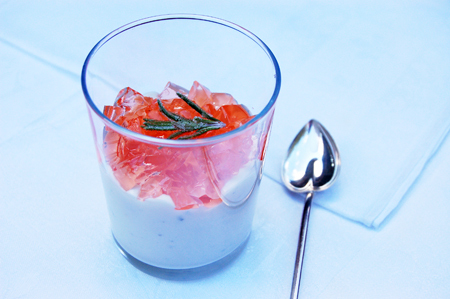 Then, as shown, garnish with a few chopped chives and tiny swirl of crème fraîche. 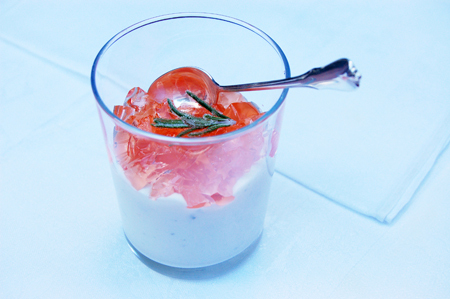 I also created a new verrine for Mark’s birthday - a mousse of creamy Cambozola cheese topped with tiny cubes of spiced rosé gelée, and garnished with crystallized rosemary leaves. The combination of the crunchy sweet rosemary leaves, the color and slight resistance of the spiced rosé gelée and the complete acquiescence of the mousse made for a lovely beginning to a special fireside evening! So, look at some of your favorite first-course recipes, side dishes and desserts and see what you can figure out for a verrine presentation. Then, check out your china cabinet for some special glassware. (Or, is this the perfect excuse for a "to me, from me, love me" gift - a shopportunity?) No matter what you do, I am sure your guests will enjoy this unique, creative and attractive way to begin a meal at your table. Doreen and I send all our best wishes to you and yours for a safe, peaceful and joy-filled holiday season – and a gastronomically adventurous (and tasty) New Year! Lightly oil a 5-inch by 8-inch non-reactive baking pan. Line the bottom and two sides with parchment. Lightly oil the parchment. Bring rosé, sugar and star anise to a boil in a small saucepan over high heat, stirring until sugar is dissolved. Lower heat and simmer about 8 minutes, and wine mixture is reduced to 1 cup. Remove from heat and discard star anise. Place the egg whites in a medium mixing bowl. Place a small sheet of waxed paper or parchment on the counter. Using a hand-held mixer, beat the egg whites until stiff peaks form. Set aside. In a large mixing bowl, using the same beaters (no need to wash), beat the cheese until smooth (the veins of blue cheese will still be somewhat lumpy), then slowly beat in the light cream until smooth and creamy. Take a third of the beaten whites and stir in to loosen the cheese mixture. Then gently fold in remaining whites until fully incorporated. Divide mixture among 4 verrines. Remove gelée from the refrigerator and unmold using a thin spatula to release the sides and using the parchment to lift out onto a cutting board. 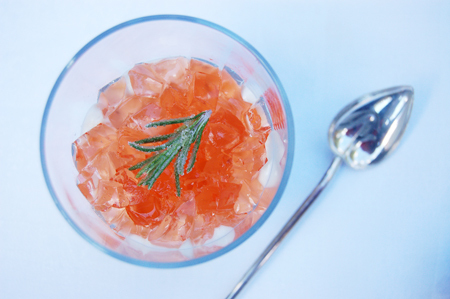 Using a lightly oiled sharp knife, cut gelée into 1/4-inch cubes and divide among the four glasses. Cover verrines in plastic and refrigerate until ready to serve. 20 minutes before serving, bring them to room temperature. Top each with a spring of crystallized rosemary and serve, preferably with a Sauternes. Your beautiful photoraphs make the verines jump off the screen! I can't wait to make the rose gelee one. 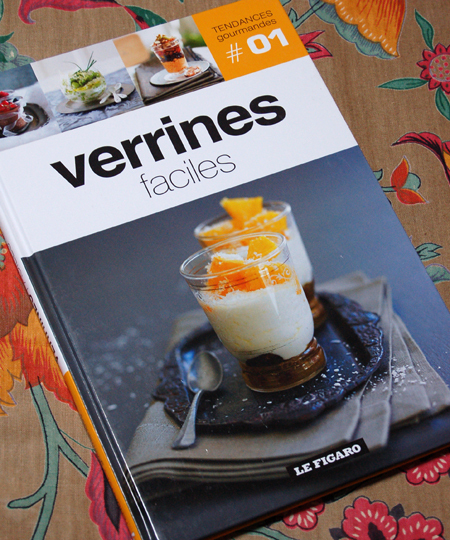 I still think you should put a cook book together on verrines. 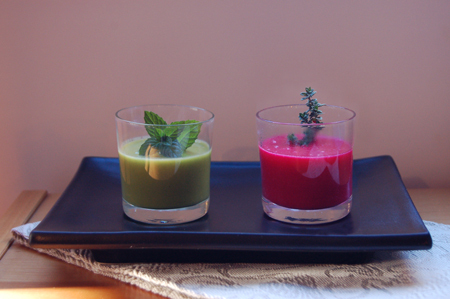 It was really fun, as always, to work with you on this verrine project. You always have such cool ideas...I love your glasses and am going to keep an eye out for interesting small spoons, as you have pictured. So much of enjoying food is presentation and so much of that is imagination. Un grand merci! Thanks, Susan! And thank YOU for the inspiration for this post! And for your very nice comment, as well. It was fun to do - makes me want to do entire posts of china, crystal, linens and silver! The heart-shaped spoon is actually a lemonade spoon, and is great for verrines in tall glasses! The swirled-handled spoon is one I bought from a silversmith in Monterrey, México. Happy New Year! David, your photographs are luscious are usual! I am wondering about the linens in several of the pictures. They look like ones I had purchased in Sicily (alas none for me)this past June. Thanks, Carolyne! It was fun photographing this post!